Codec – something you never knew you needed until your videos started to play upside down and with green stripes. As always I am sticking to tried and true solution. I am using K-Lite Codec Pack for a long time and I never had issues with it (some minor but those were solved by updating to newest version). What a codec pack is? Codec (coder-decoder) is something you need to play video. Some codecs come with Windows, some have to be downloaded and installed. Codec pack is bundle of different codecs that aims to install everything needed for playing most common video formats. It is supposed to be easy but I see whole bunch of these? 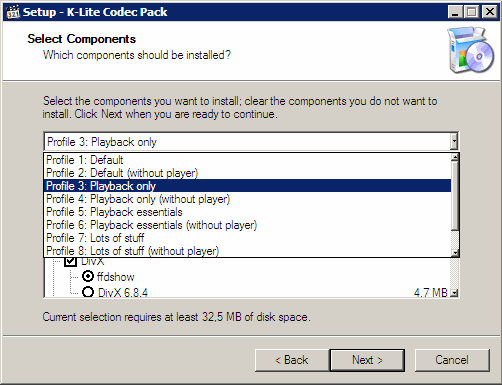 K-Lite Codec Pack 64-bit – additional codecs for 64-bit players like Vista Media Center. I advise to go for Full and choose “Playback only” profile while installing. This gets you what you need without what you don’t. This will also install Media Player Classic and set file associations to it. If you want to stick with your current video player you may go for “Playback only (without player)”. I was recommended to get all-in-one video player instead? Video players that play everything are becoming popular lately. Basically such player contains bundle of codecs (often same as codec packs) but instead of installing them into system it keeps them close and personal. Advantages of all-in-one player – they are often portable in design and don’t interact with system files at all. Advantages of codec pack – works for any application or player of your choice. K-Lite has quite a history of including proprietary and cracked versions of codecs into bundle. They seem to ended this practice long ago and all such components I am aware off are removed… Still video codecs may be very unstable legal zone. If that is issue for you choose Corporate pack and study all components before using it. I also uses k-lite codec and it really help me a lot… it gives me better solution to my media problem…. Yeah, it has some checking for errors and removing broken codecs functions so it is indeed a problem solver as well as solution for playback. And if you don’t want all that stuff crapping up your pc, just download http://www.cccp-project.net a small DirectShow filter pack. I am no codecs expert and don’t pretend (like many) to be one so I can only repeat that I am using K-Lite codec pack for a long time and it always worked good for me. And by the way you can see in post I am recommending “Playback only” install that only ensures playback without any extras. I’ve kept installing K-Lite Codec Pack’s ‘Standard’, because installing ‘Full’ with ‘Default’ profile made my system crash when calling certain AVI files, and I have no idea why. Rarst here suggests ‘Full’ with ‘Playback only’ profile. Perhaps this alternative is the solution to my problems. Anyway, nice article, Rarst. I’ve been using K-Lite (codec standard pack + QT Lite + Real Alternative Lite) since always. Great package. Codec issues are total pain to troubleshoot. Usually I just try to uninstall everything related,scrub Program Files and regisrty and then make clean install of K-Lite. i am using windows media player in vb6.0 to play .mpeg,mp4… files.to run mp4 files i am using K-lite codec.exe,but the movie is not playing continuously ,i t is playing like play-hang-play-hang -play.can u please help me to solve this issue. Are you using latest version of K-Lite? Had you tried reinstalling it with “playback only” profile, as recommended in post? Most of the time this fixes any issues.